"To us, Mr Bond, we are the best." The Man With The Golden Gun follows on much in the manner of previous entry (and Moore debut) Live And Let Die. It's fairly lightish in tone with a creeping emphasis on humour and visual jokes. The film was moved fairly quickly into production soon after Roger Moore's debut, a move intended to help establish the actor as James Bond to audiences who were probably still wondering when Sean Connery was going to return. The film tends to rank at the bottom of many anorak best James Bond film lists but I think this is unfair. It's not vintage Bond or classic Bond but The Man With The Golden Gun is a classier and more entertaining film than a lot of people have given it credit for over the years. 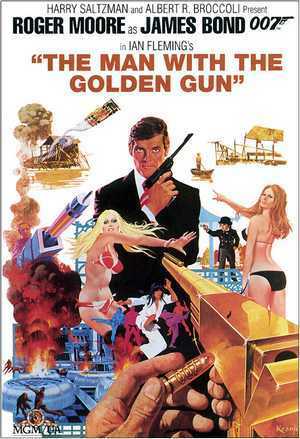 It lacks the scope of some other films in the series and is saddled with a topical plot device which dates it somewhat, but The Man With The Golden Gun is a colourful and likable enough addition to the series and has a certain amount going for it. The film has a strange pre-credit sequence that is very interesting because it is so strange. A stereotypical Mafia type character arrives on Scaramanga's private Island in the Far East. He appears to have been hired by Scaramanga's diminutive manservant Nick Nack to kill his boss, but all is not what it seems. The Hitman is there to give Scaramanga a bit of target practice in his funfair style 'Hall Of Mirrors'. The bright colours and visuals in these scenes look great on DVD. It's all very strange and entertaining although for the second film in a row Bond doesn't really feature in the PTS. Maurice Binder's titles are not his best ever and John Barry later confessed that Lulu's song was one of the weakest Bond themes for him. Personally, I thought the song was reasonably catchy and camp in a seventies James Bond film sort of way and have never had a major problem with it. The majority of the film is set in Hong Kong and the Far East and The Man With The Golden Gun can be praised for its atmosphere and colourful sense of location. It never quite pays off its fascinating premise but it does have a lot going for it. 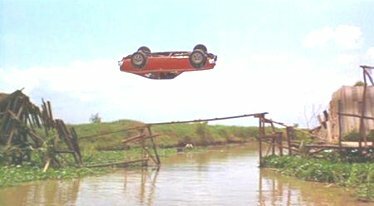 There's a fantastic car chase scene which builds up to an amazing 'spiral' car stunt involving the fragments of a 'bendy' bridge. And of course a very well done fight scene between Bond and some heavies in a belly dancer club in Beirut. Roger Moore has a funny quip at the end and writer Tom Mankiewicz gives Bond some decent lines throughout the film. I think Mankiewicz says on the DVD that Moore knew his way around a comedy moment or scene better than Connery so they upped the jokes. The moment where Bond asks why anyone would have a motive to kill him is good fun. "Jealous husbands!" replies M. "Outraged chefs! Humiliated tailors! The list is endless!" Popular criticisms of the film are usually aimed at the increasing slapstick humour and innuendo. Clifton James returns as Sheriff J.W. Pepper and is soon embroiled in comic capers involving elephants and falling into a river and later we get kung-fu schoolgirls. The film perhaps also lacks the huge grand scale set-pieces that you would usually expect from a James Bond film. A few more cliffhanger type situations world have been helpful. And Britt Ekland as Mary Goodnight ranks fairly high on 'Most Annoying Bond Girl' lists. To be fair she isn't helped by the way her character is written, but she does look good in a bikini! 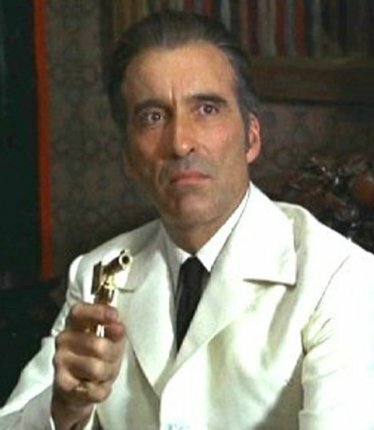 The biggest thing the film has going for it is the great Christopher Lee as Scaramanga. Lee (who is related to Ian Fleming in real life) is great in the film and appears to have relished the chance to be a Bond villain and escape from a Hammer Dracula set for a few months. He's set up as the 'flipside' of Bond. Both are killers, both are refined, but one works for his Government and one is a free agent. Scaramanga is eager to discuss this theme with Bond in the film and Moore and Lee have some decent exchanges and scenes together. "At a million dollars a contract I can afford to, Mr Bond," says Scaramanga after Bond comments that he lives very well. "You work for peanuts, a hearty well done from Her Majesty the Queen and a pittance of a pension. Apart from that we are the same." Hervé Villechaize as Nick Nack is a strange piece of casting that just about works. It was a nice twist on the 'Oddjob' type assistant/henchman. Maud Adams as fine as Andrea Anders and adds a classy presence to the film. Bernard Lee and Lois Maxwell are of course in the film as M and Moneypenny and Desmond Llewelyn makes a welcome return as Q after missing out on Live and Let Die. And, thankfully, The Man With The Golden Gun is aided by the return of John Barry, the composer who always most seemed to fit the cinematic James Bond. Barry's score in this film is not regarded as his best ever but it's pretty good. One other thing that should be mentioned in any review of The Man With The Golden Gun is the wreck of the RMS Queen Elizabeth in Hong Kong harbour which is used as a secret HQ for MI6 in the film. This topsy turvey location with slanted rooms is a nice offbeat touch and adds to the slightly strange atmosphere of the film. Roger Moore is still not quite settled on the best way to play James Bond here. There is a moment in the film where he smacks Maud Adams around to get some information and it really doesn't suit his interpretation of Bond. His third film was the one where he finally established himself in the role and seemed to find the right balance to suit his own persona. On the whole though Moore is very polished and competent in the film and although a departure from Connery/Lazenby, managed to grow into the role and prove that different actors could keep it going. The film is entertaining although the pace does slacken now and again. It's not a lavish action-fest like some of the other Bond films but compensates with a good sense of atmosphere. Scenes in real locations like a kick-boxing fight add a nice air of authenticity to the film. The climax on Scaramanga's private island is good fun with solar guns, liquid helium pools and some crisp banter between Bond and Scaramanga. It becomes a bit silly at times but, as I never tire of saying; it's a James Bond film. Overall, The Man With The Golden Gun is a colourful and underrated addition to the series.